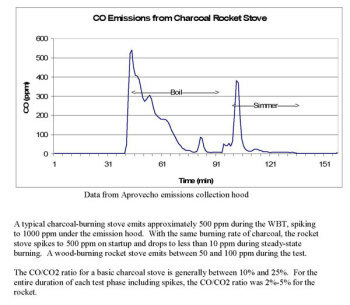 Charcoal has a specific combustion value on the average of 28,900 kJ/kg. Its density is strongly dependent on the wood used in its production. An average value is about 400 kg/m3 according to Earl (1975). Comic for Dissemination - Tanzania: Use an Improved Charcoal Stove! "Use an Improved Charcoal Stove!" by Shima Sago, the Assistant Coordinator at Tanzania Traditional Energy Development Organisation, made this promotion story. grams/1.65 lb of pine chips to cook 8 pounds/3.63 kilograms dry weight of pintos. That is 14 liters of volume with water or 104 servings-35 gr/ 1/2 cup cooked volume (1/4 cup dry weight) servings. I fired two of the rings today for a brief time, perhaps 3 hours at temperature. No particular care was taken regarding the slow initial temperature rise.